I have a couple of thought-filled posts coming together that may take a little while longer, but for now I need to acknowledge today’s little bits. It mas no monumental day but nontheless a day I’d like to remember. It’s ridiculously cliched but it’s all in the little things. The Stewards and the Lewins’ drove over to Richmond. It’s my very fabourite market town, an affection I’ve held since a school field trip when I was nine. We didn’t get into the town centre (sigh) but went to a real jewel in the town’s crown – Richmond Station. An old station that has been opened up as cafe, old-fashioned cinema and various artisans selling their ware. 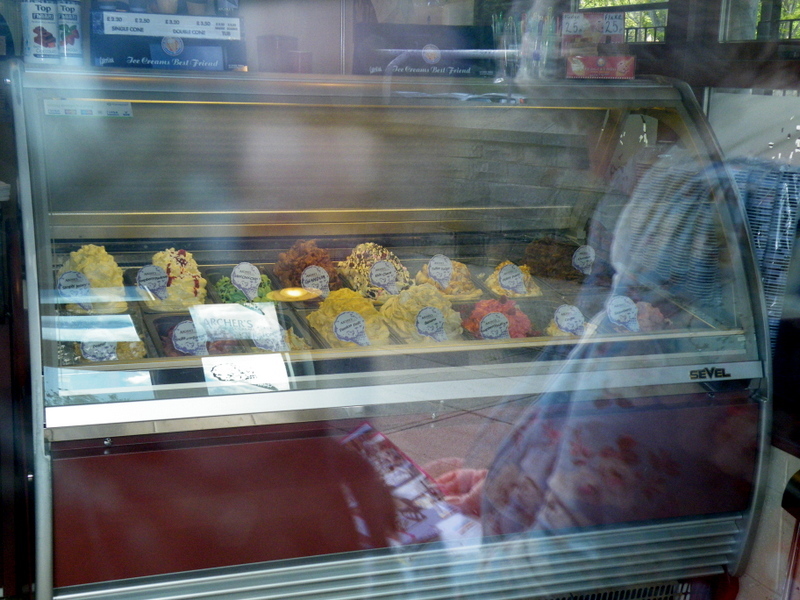 From outside I was squashing my face up against the ice cream parlour’s window. Please excuse the flash-induced reflection, I was too busy drooling to select the right camera settings. But look at that ice-cream! Walking in, a smell of fresh bread hits you and pulls you to the bakery and there’s a fudge shop that makes it’s fudge right there behind the counter, be still my beating heart. It’s a brilliant concept that balances an astute buisness eye with a deep sense of community. I love it. I’ve not been to the cinema yet, but when I do you’ll know about it. The Husband, the girls and The Grandad set off on a walk to Easby Abbey, and The Granny and I headed into old station. Queueing up and eyeing up potential purchases left us spoilt for choice. A. Mazing. 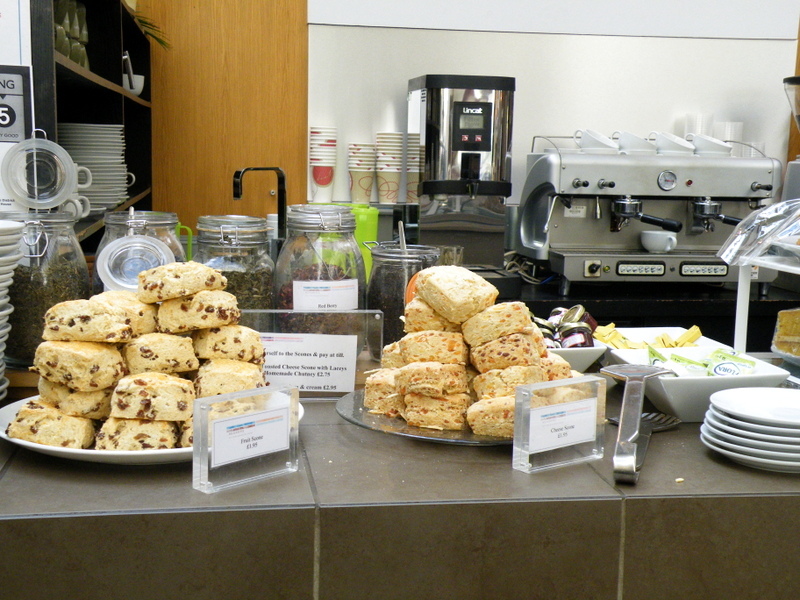 We had to indulge our weakness for fresh cheese scones, with the full intention of going back for cake. Armed with plates of deliousness and coffee I sat down with my mum to brainstorm a possible and very exciting project. 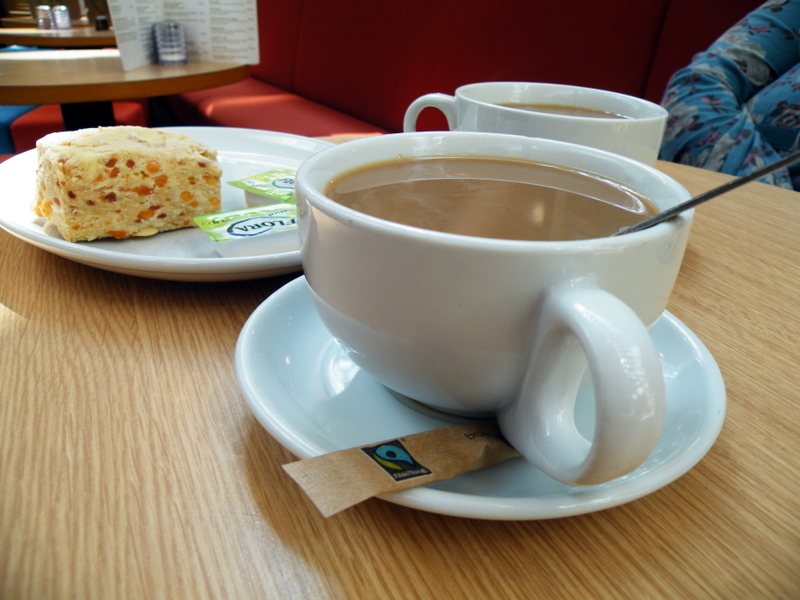 The scone was amazing and conversation very promising…! Our motley crew returned and I was so proud to hear that Ruby had walked the entire way. The Husband reckons it was about 2 miles, Go Roo! That was definitely a call for a celebratory icecream. For all of us. 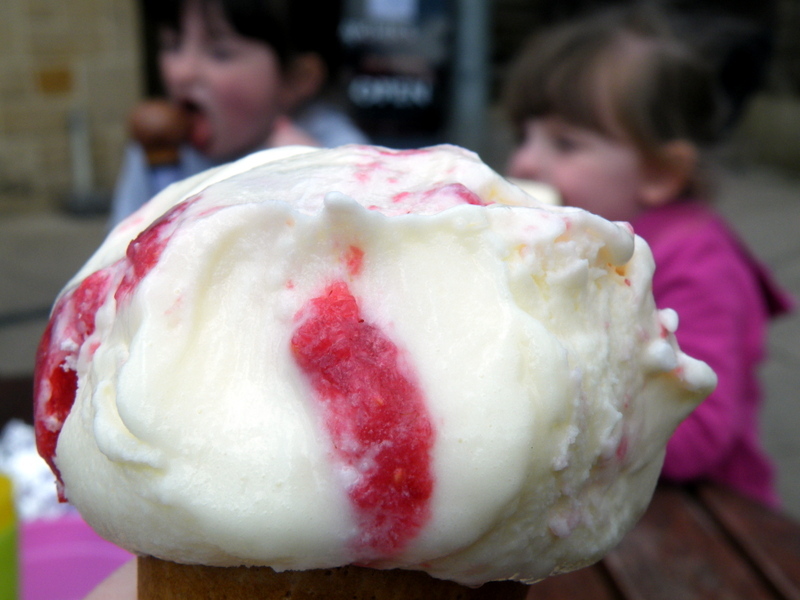 I had Raspberry pavlova ice cream and it was awemsome. Yes, that’s real raspberry in there. If it wasn’t for Thunder and Lightning (more on that soon) this icecream would become a firm favourite. Chloe told me that they’d had an icecream at a different place each day of our holiday. I wish that had originally been intentional – what a challenge to set yourself! It would be a shame not to continue with it. The Station is very cool indeed. If you’re passing, you must call in. If you’re not passing, drive through the night if you have to, just go there. You won’t be sorry. We headed back via the Co-op for some basic food essentials. It was going to be in and straight out but I was bemused to see a Dorothy perkins Sitting there at the end of the store. It have been rude not to go and have a look. And check out the clothes. And peruse the Jewellry. By this time The Husband and Roo had headed back to the car but Chloe stuck with me. I saw a gorgeous chunky brass ring and pushed it on my finger to see if it would fit. And it wouldn’t come off. I’ve been in this sotuation before in Blackpool’s Marks and Spencers but after a minute or so it had come off. This time the ring was not coming off. There was just no movement at all. And my finger was going purple. I looked over to the counter and a lady was being served, that seemed to take forever. Yes, even in a crisis my pride made me wait until no one else could see me. When the counter was free I crept over to the girl behind the till. She looked up and I just lifted my hand up. “I’m sorry. I’ll pay for the ring, but could you get it off for me?” The girl went white and just kept repeating “Oh my goodness”. She picked up the scissors but her nerves made her shake a little too much for my liking. Unsuccessful she looked around for help. She looked again at my finger and looked like she was going to pass out when she informed me it was starting to go blue. I knew that already thanks, there’s not much else I could really look at right then. She dashed off to find someone else and I grabbed the scissors. Risking life and limb I hacked at the plastic strap that held the ring to the store card. I just about got the tip of the scissors behind the strap, snapped it off and the ring fell free onto the counter. As the girl came back with the cavalry I was waving the offending ring in the air proclaiming joyfully “It’s off! it’s off!). She was so sweet and quietened my apologies. You’d think I’d make a hasty exit but stayed another twenty minutes at the jewellry stand. 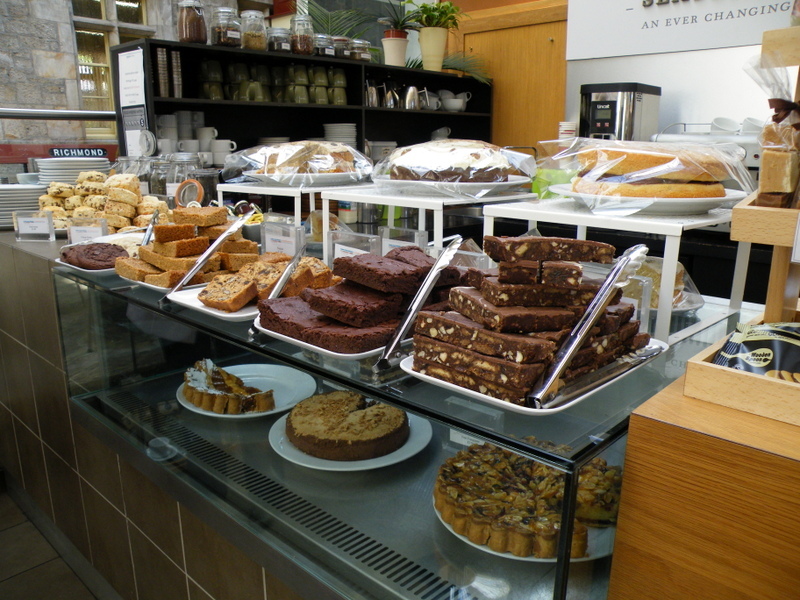 Oh I forgot to say that before we went for ice cream I bought a slice of Flapjack and a slice of Chocolate Brownie. It’s all cut up into pieces in the kitchen and I’m practicing my self control to see how long it will last. Don’t tell me Ma, she’s only next door and these cakes are supposed to be sharies. 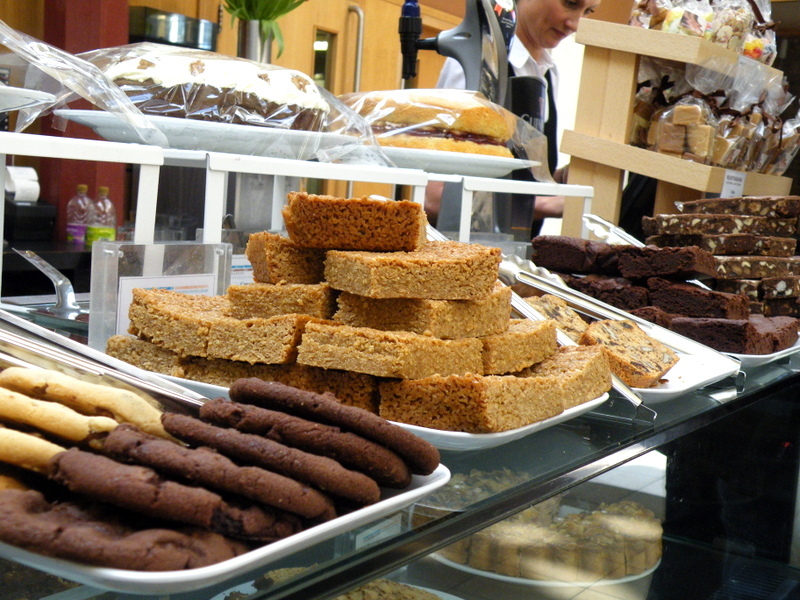 The Brownie is lovely but The flapjack is hands down the best Flapjack I’ve ever had (even Marks and Spencers! Am I allowed to say that?). Perfect level of chewiness with a buttery aftertaste that makes it very difficult not to go straight back into the kitchen for another piece. It’s been going so well! I’m quite surprised. 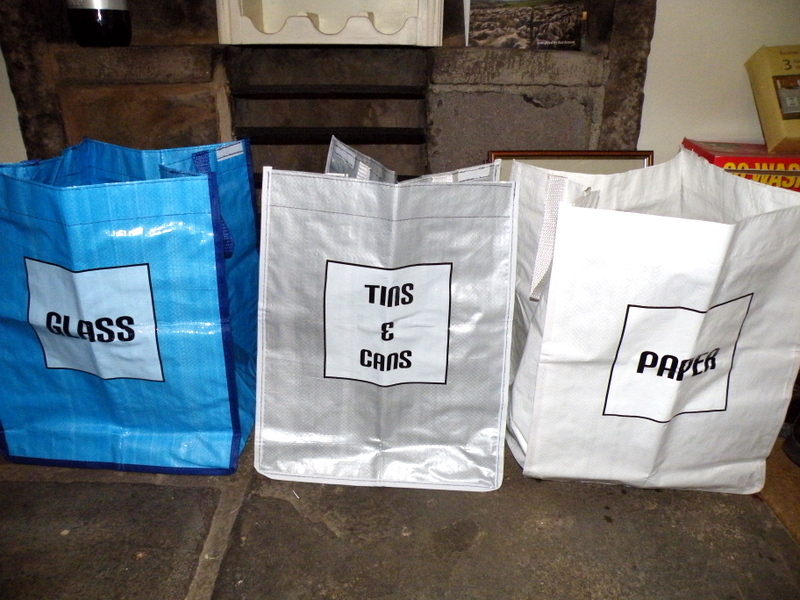 Almost everything has been able to go in the fire or into the recycling bags. It didn’t take long to notice that the bags didn’t include space for plastic, and that’s just silly in today’s age of plastice overload. So we have a carrier bag with plastic containers that I refuse to put in the bin. I’ll find somewhere for it. I’m not going to expand on my thoughts much because you’ll be hearing more soon. Phew. All that in just a day. I’ll sleep well tonight. Yorkshire air is good for the soul. If you don’t believe me you’ll have to try it for yourself. A beautiful cottage, my man, my girls and a couple of days makes me a happy girl. I think what we love most about it is rewiring our minds to live more simply. And it’s this that has led to a family challenge for the week. We’re going to see how much, or how little, we dump in the bin. In day-to-day life I have to admit that recycling is at the very back of my mind. I probably throw loads of recyclable items into the bin out of carelessness and thoughtlesness. The council provides A green bin for garden waste, a blue bin for cardboard (I just had to ask The Husband what goes in that one. Shameful I know), a silly little container for glass jars and cans and a Black bin for general waste. So there’s no reasonable excuse not to do it. I blame The Husband. He takes care of it. He knows the days they are collected, he pulls to the front of the house when appropriate and brings them back when they’ve been emptied. It’s just off my radar. And when something’s not on your radar, when you’re hearts not really into something, its very easy to push the reality from your mind. So when I’m running around, looking after the girls, sorting the house and basically juggling life, I’m completely guilty of choosing convience over the environment. I’m a bad bad person, I know. You’d think it would engage my brain cells, there’s a land fill just a few minutes drive from where we live. There a really lovely new housing estate being built right next to it and it’s such a shame that if the wind is blowing the wrong way you wouldn’t’t want to be relaxing out in your garden! But this is it. This could well be the tipping point for me as I endeavour to cut waste. I might become a hippy and wear…what do hippies where? Anyway, I’m really excited about it (maybe this simple living is just really boring?) and this is where we were at tea time tonight, 24 hours on in our challenge. The cheerios and the raisins shouldn’t be in there. The Husband owned up to it and said he threw them in before he could think. The only other thing was kitchen foil. What are you supposed to do with kitchen foil? I love the stuff but now it’s feeling a bit like the enemy. And that’s it! that is the grand total of our waste. 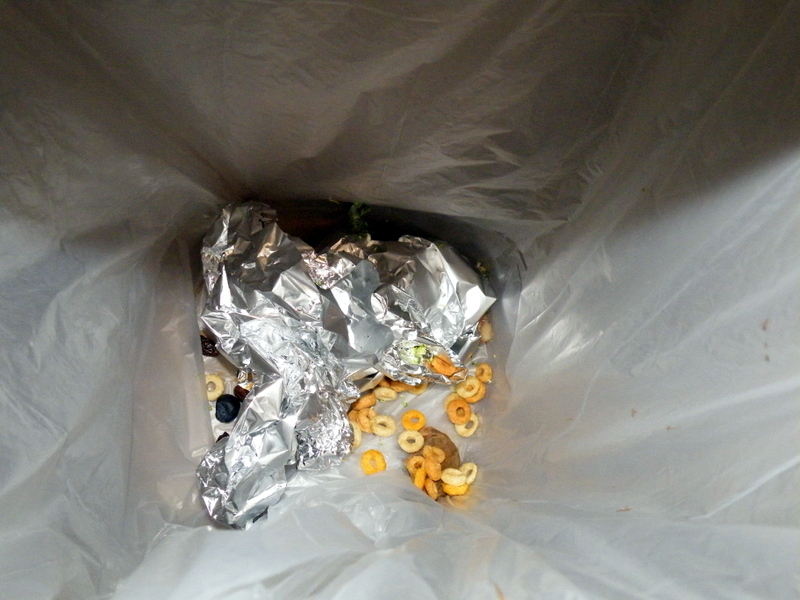 And doing something like this brings the issue of recycling to the forfront of your mind. It gets you analysing everything you use – I’m on the side of the environment mr sandwich wrapper, are you friend or foe? I really wanted to start a compost bin a little while ago. 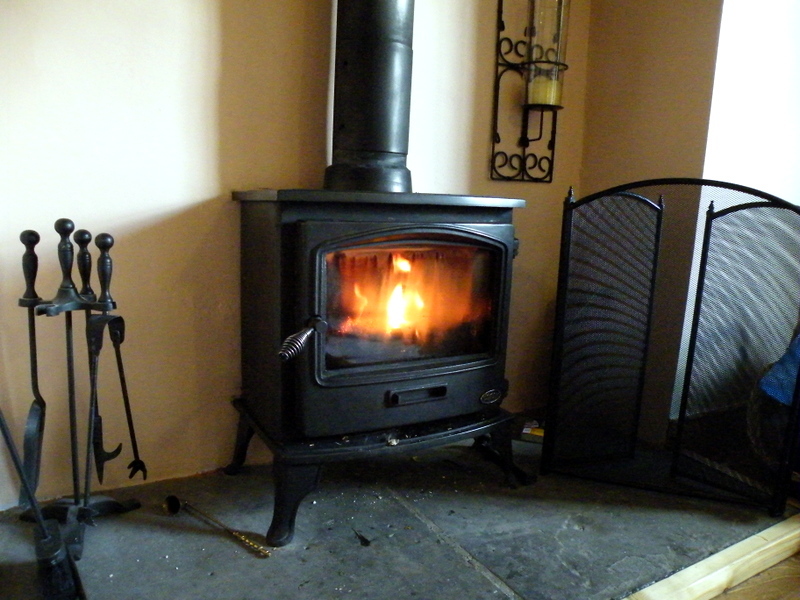 But if I’m honest it was because I saw a ceramic container to keep in the kitchen and I thought it was really pretty…Now – Now I’m thinking game on, especially when I’m back home and we don’t have a wood burner to conviently dispose of waste food etc. And if anyone wants to slam me because I’m doing something bad to the air by burning stuff – Please. One thing at a time. Right now I’m busy saving the world with an empty bin.